I love crochet motifs. Love the look, the geometry and the endless designing possibilities they bring. It is one of the things that make crochet so special and something that cannot be as easily and naturally created in other crafts. However, I hardly ever crochet motif projects. And the reason for this is that I don’t enjoy weaving in ends. I can’t say I hate weaving them in, but on my personal fun scale they are somewhere between doing grocery shopping and filing paper bills. If I can procrastinate or delegate these jobs to someone, I will! So when I had an idea of designing a motif shawl, I knew that the only way to make sure it saw the light of day, was either to find someone to weave in all those tails for me or to crochet it without "ending up with endless ends". Since tail-weaving addicts are pretty rare, it had to be option number two. Fortunately, I did not need to invent any new technique as the tail-free motif method has now been around for quite a while. You might know it as "Japanese continuous crochet" from a stitch dictionary by Nihon Vogue Sha or as “seamless crochet” from Kristin Omdahl’s book. The idea is pretty simple: you work a partial motif with an incomplete last round and then make a long chain to reach the centre of the next motif on the right and “build” this new motif around this chain. You don’t complete the last round of this motif either, but make another long chain to start the next motif on the right and so on. Once you have the number of motifs you need for that row, you complete the tops of the motifs one by one, working in the opposite direction from right to left. You reach the first motif, make a long chain and start building the next row on top in the same way, all the while joining adjacent motifs are you go. Sounds long and gibberish, but it is truly ingenious! So this is the method I used when creating Halyna Shawl. The shawl layout suggested in the pattern will only leave you a couple of ends to weave in: the starting tail and the ending tail. Depending on how you join new skeins, there might be a couple more ends from all additional skeins, but I used this method, which worked for my yarn, so I did not even have those! You might want to ask me, whether or not someone completely new to this technique can work this pattern. 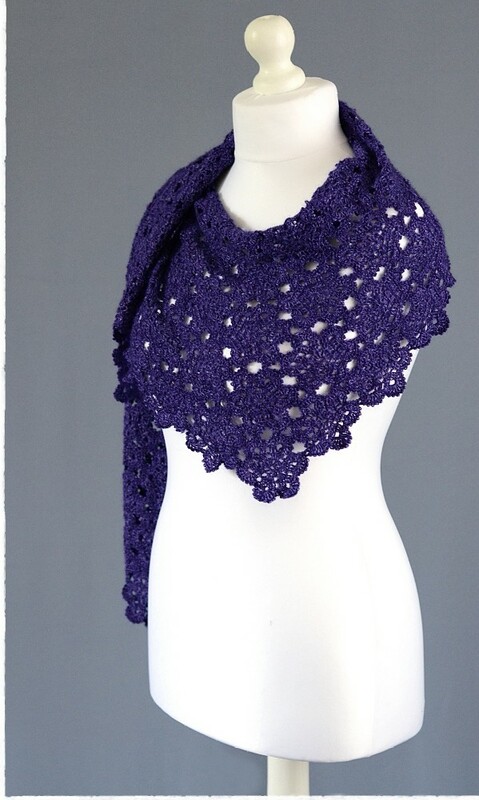 I made every effort to make sure it is possible to crochet the shawl without any prior knowledge of this method. The pattern comes with charts, written out instructions and additional visual support. However, bearing in mind the complexity of the motif itself and the thinness of the yarn used, as well as the limitations of a single pattern (as opposed to a full-blown resource book) you do need to be prepared that this will not be a quick and easy project. But once you get the hang of it, it is easy sailing, and you would be qualified to tackle any other continuous motif project. Another downside is that after a few continuous rows of motifs it becomes harder to manipulate all this amount of fabric as it starts twisting around the beginning chain of every new motif in a completely unruly fashion. The obvious solution to this is to instead break the layout into smaller “blocks” or “modules” and crochet them separately, joining them together in the last “pass” (thank you, Lena, for pointing it out!). There will be a few extra ends to weave in, but nothing in comparison to the regular “motif-by-motif” approach. Feel free to do just that! If you are interested in purchasing this pattern, use coupon code HALYNA25, valid till May 31, 2014, to get 25% off the price.